Where we last off with The Doctor and Bill, they were trying to get back from the future in time for tea only to find themselves landing on a frozen Thames River in Regency London. 1814 to be precise. “Thin Ice” opens with them finding themselves amidst a frost fair, in what the Doctor says was the last great frost the city experienced. Bill also learns that the TARDIS as a wardrobe room and despite wanting to actually get home and not feeling very cheerful about visiting a still-slavery era time, she ends up game to explore. Kudos to the BBC costuming department, Bill’s Regency costume is pretty close to the correct silhouette and general idea of pieces for the timeframe. I’m actually 85% sure one of the female extras was wearing one of Jennifer Ehle’s Elizabeth Benet costumes from the 1195 Pride & Prejudice miniseries which wouldn’t surprise me, BBC reuses a lot of costumes. 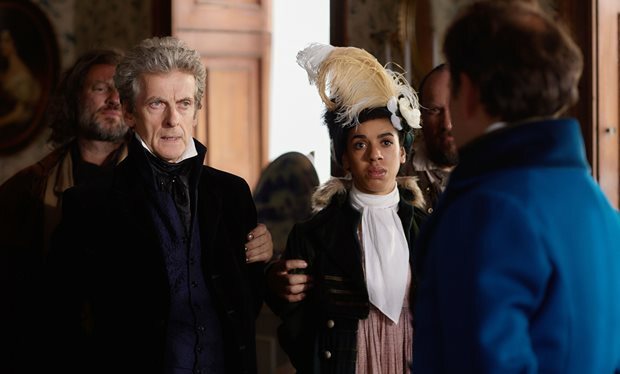 As they start wandering the fair, Bill is surprised to find how black Regency London actually is, and the Doctor makes a comment that so was Jesus and makes a dig at whitewashing. This begins a streak in the dialogue that is so self-aware that I found it giving me pause. Was this still MoffatWho? Yes, yes it was and this episode was written by Sarah Dollard (who had written last season’s “The Face Of the Raven” as well as having written for Merlin, Primeval, and Being Human). As Bill and the Doctor explore the Frost Fair (which makes me long for it to be time for The Great Dickens Fair in the Bay Area), some cute but quick-fingered children thieves target the Doctor and make off with the Sonic Screwdriver, only for one of them to be swallowed into the ice after a circle of small green lights underneath circles the boy. Bill had been seeing a few of the lights at first, not knowing what it was, but whatever it is it’s likely killing people who wander too far into the ice alone. Cue a giant fish monster that lives under the Thames because of course. Honestly, given how grossly polluted and akin to an open sewer the Thames was still at the time, I’m amazed anything thrived under there supposedly. Must be one hell of a sturdy fish. Witnessing the young boy die shakes Bill terribly; she’s never seen anyone die before and is disgusted by how nonchalant the Doctor is about it. Here we get an interesting, near mirror-like conversation between that echoes one between the Tenth and Eleventh Doctor in “The Day of the Doctor”, how the Doctor has seen so many people die he doesn’t even keep count anymore, he moves on. Bill pointedly asks him if he’s killed anyone, and it’s an unpleasant conversation overall that shows just how detached at times the Doctor has become since his angry, war-torn days as the Ninth Doctor and the regretful, emotional Tenth Doctor who began to go too far. In many ways this conversation is almost better than the one between Tennant and Smith’s Doctors, it’s in many ways more understated yet the emotions feel more palpable when the other part of the conversation is coming from a companion so new the Doctor’s world and witnessing death for the first time. The Doctor says because he’s so old he doesn’t have the luxury of time to be outraged, which is the one line that really didn’t fit here as we’ve definitely seen him be outraged plenty of times. This conversation does create some tension between Bill and the Doctor, but it’s compartmentalized for the moment to help Kitty, one of the children thieves who seems to be their de facto leader, and the other kids before more people go missing. Their investigation points them eventually towards a Lord Sutcliffe and a work yard where a propellant that burns hotter than coal and can light underwater is being manufactured. Note to show, don’t let Cersei Lannister near this stuff. This, of course, connects back to the creature(s) in the river. As it turns out the lights under the ice are smaller fish-like creatures that essentially capture people for the creature, who is chained in the river and kept prisoner by Lord Sutcliffe, who really don’t know any better and is a blatant racist who insults Bill off the bat only to earn a punch from the Doctor, who had previously told Bill to let him do the talking to be diplomatic not a moment earlir. How I wish that punch had come with a solid “fuckity-bye!” but that, dear readers, would be crossing the Capaldi streams too much. I don’t want to give too much of the story away here. “Thin Ice” is a solid, Regency creature story that feels a lot on line with some of the Classic Who historicals, and this is 3 for 3 of actually solid episodes that on the one hand make me happy to see the show return to better form again after years of inconsistency, on the other a bit annoyed that Moffat has had it in him to produce a consistent level of better quality and we’re only just seeing it again now. Granted, it could be that the pool of writers they’re going with this season are just super solid, but the flow of the episodes so far feels so much better than it has in so long. I suppose he is saving the best for last? Like I said, I haven’t been his biggest fan but I am trying to be even in my critique. I hope Dollard continues writing for Who in the upcoming Chinball era, I think she writes good stories and has written some interesting, fantastical settings that I’ve enjoyed, this episode included. It reminds of Gaiman when Gaiman is on point a bit. My one big gripe about this episode, though, is we get almost verbatim the speech from “Kill The Moon” where the Doctor quickly forces Bill to choose whether to save the big fish or not because he can’t decide, it’s not his planet it’s her, etc. etc. and I would have preferred to not be reminded so strongly of that episode, which was a very weak one in my opinion. It’s one thing to revisit this concept, but it was so damn near word-for-word. Overall though, this was a strong B+ episode near flirting with A-; it was a genuinely fun story with a good setting, and good character stuff where the fun was interspersed with some pretty deep moments as well. The episode, like the last, ends with setting up for the next episode. Which what is this oath? To who? And will it actually be executed well and not a disappointed flop of a plot point? The episode ends with Nardole going to the Vault and something in it knocking suggesting what’s inside isn’t a what but a who. Could it be Missy? Simm!Master? The next episode is titled “Knock Knock” so maybe we’ll get more clues. Speaking of, I miss Missy/Michelle Gomez and hope her episode is coming soon. I’m so enjoying Bill and her joie de vive but also glad she isn’t just okay with everything happening around her and overlooking things for the sake of adventure or heading down the YOLO route Clara went. I’m not sure I love the new Sonic design, to be honest. Bill’s dark green redingnote is super pretty and I want it. That is all.